Laos, officially the Lao People's Democratic Republic, suffers severe unexploded ordnance (UXO) contamination left over from the Vietnam War (2nd Indochina War) 40 years ago. With support of the German Foreign Federal Office, APOPO has built capacity for integrated humanitarian UXO clearance and capacity development projects in Khamkeut District of Bolikhamxay Province, central Lao PDR. It is estimated that during the Vietnam War (2nd Indochina War), more than 2 million tonnes of ordnances and 270 million bombies (cluster bomblets) were dropped. More than 80 million bombies are believed to have failed to function resulting in significant UXO contamination of vast areas of the country. 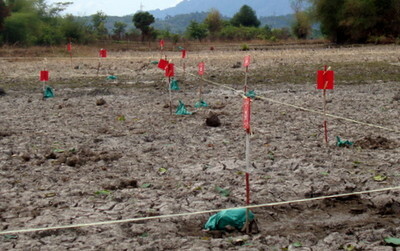 All 17 provinces in Lao PDR suffer UXO contamination with about 25% of all villages in the country affected. Since the end of the war 29,506 people have been killed and 21,019 injured by explosive remnants of war (ERWs). Following an assessment with the Khamkeut District village Mayors in 2010, it became clear that there are more than 2,000 ha of high priority areas - areas that are heavily impacted by UXO and urgently needed for food security, poverty alleviation and socio-economic development - in 32 of 68 villages in the district. The German Federal Foreign Office (GFFO) partnered with APOPO to provide funds to manage humanitarian UXO-clearance and capacity development projects in Bolikhamxay Province (Khamkeut District) in order to enable the transition of UXO/mine action to national ownership. 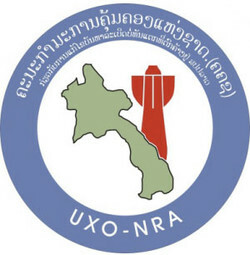 The National Regulatory Authority for UXO Mine Action Sector in Lao PDR (NRA) maintains a centralized approach to its oversight and coordination of mine action activities but had the desire to decentralize its responsibilities and enhance the capabilities at the provincial/regional level. The APOPO Lao project therefore supported NRA to establish a Regional Mine Action Centre, under the ownership of the NRA and the Provincial Authorities. This will entail the establishment and capacity building of an Information Management Unit and a Quality Management Unit. This Regional Mine Action Centre will provide prioritization, planning, coordination and monitoring of evidence-based mine action activities for Bolikhamxay Province, Khammouane Province and Xieng Khouang Province. As of August 2014, APOPO's work in Lao PDR came to an end pending further funding.